80 € the night I book ! 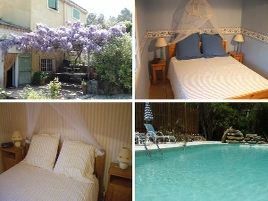 In a little corner of paradise in the heart of the Bandol vineyards, between the coast and the back-country of the Var. Lovely swimming pool. Comfortable rooms, all different, in mediterranean tones. Delicious breakfasts served under the arbour, near the fountain. Welcome as warm and friendly as the house. Patricia is also an expert in dietry and relaxation techniques and is always ready to be consulted. .
- Golf Dolce Frégate à 10 km. 4 rooms with shower, WC and TV. From 70 to 100 euros (2 pers.). Extra bed 20 euros. The closest station is Bandol, located at 10 km. The closest airport is Toulon-Hyères, to 40 km.